Biotinylated Human IgG Fc, Avi Tag (IG1-H8213) is expressed from human 293 cells (HEK293). It contains AA Glu 99 - Lys 330 (Accession # P01857-1 ). This protein carries an Avi tag at the C-terminus. The protein has a calculated MW of 28.4 kDa. The protein migrates as 36-40 kDa under reducing (R) condition (SDS-PAGE) due to glycosylation. Biotinylated Human IgG Fc, Avi Tag on SDS-PAGE under reducing (R) condition. The gel was stained overnight with Coomassie Blue. The purity of the protein is greater than 95%. 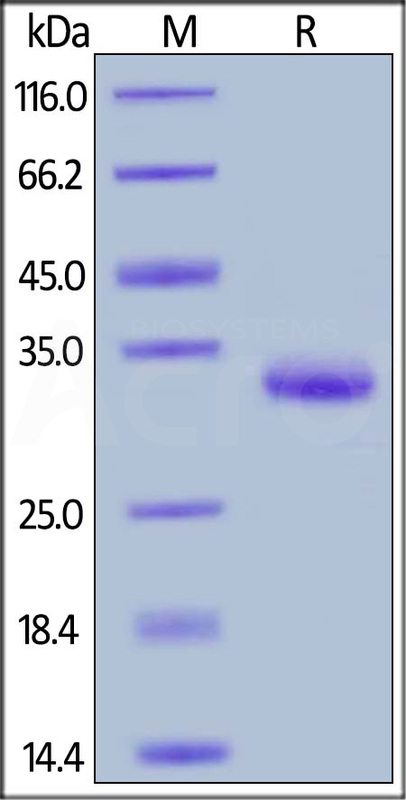 Immobilized Recombinant Protein G (Cat. No. 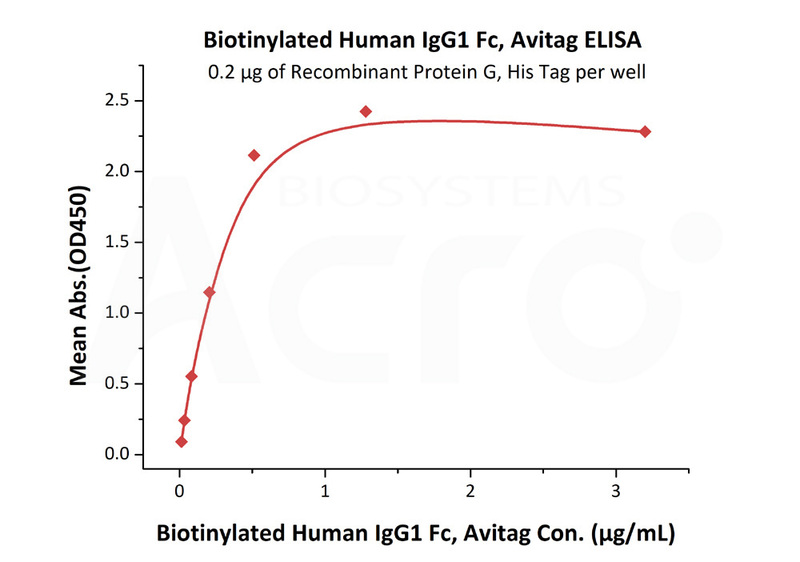 RPG-S3140) at 2 μg/mL (100 μL/well) can bind Biotinylated Human IgG1 Fc, Avi Tag (Cat. No. IG1-H8213) with a linear range of 13-512 ng/mL (Routinely tested). Authors: Mukundan S, et al. Crystallizable fragments composed of the carboxy-terminal halves of both IMMUNOGLOBULIN HEAVY CHAINS linked to each other by disulfide bonds. Fc fragments contain the carboxy-terminal parts of the heavy chain constant regions that are responsible for the effector functions of an immunoglobulin (COMPLEMENT fixation, binding to the cell membrane via FC RECEPTORS, and placental transport). IgG1 Fc was reported has a novel role as a potential anti-inflammatory drug for treatment of human autoimmune diseases. (1) Anthony RM, et al., 2010, J Clin Immunol, 30 Suppl 1:S9-14.